EpiPen-Maker Mylan Settles For $465 Million In Medicaid Dispute : Shots - Health News The federal Medicaid program had accused Mylan of underpaying required rebates for the EpiPen, which is used to reverse serious allergic reactions. The company said it committed no wrongdoing. 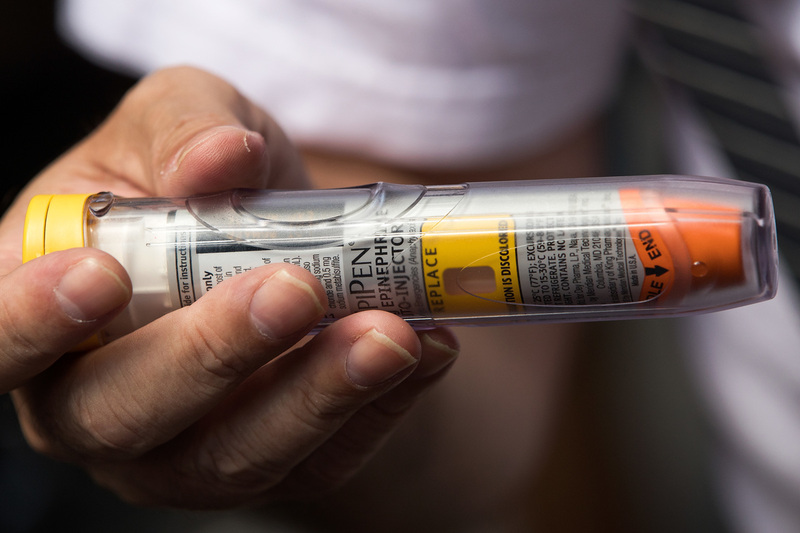 The federal Medicaid program had accused Mylan of underpaying required rebates for the EpiPen, which is used to reverse serious allergic reactions. Drugmaker Mylan N.V. announced Friday that it had reached a $465 million settlement with the U.S. Justice Department and other government agencies to resolve questions over rebates required by the Medicaid program. The deal settles allegations by the Centers for Medicare and Medicaid Services that Mylan had misclassified the EpiPen as a generic drug and had not paid the appropriate rebates that are required by law. Andrew Slavitt, the acting head of CMS, detailed the allegations in a letter to Sen. Ron Wyden, D-Ore., this week. Slavitt told Wyden that Mylan had misclassified EpiPen as a "non-innovator" or generic drug, when it should have been classified as a brand-name product. Slavitt said the agency had informed Mylan multiple times of the misclassification. Drugs companies pay rebates to the Medicaid program of 23.1 percent for brand-name drugs and 13 percent for generics. Mylan paid only the 13 percent for $1 billion worth of EpiPens that Medicaid bought between 2011 and 2015. That cost state and federal taxpayers $163 million, he said. Mylan was facing potentially large penalties. Companies are required to report a drug or device's correct classification and can be fined up to $100,000 per violation under the terms of the Medicaid Drug Rebate Program. Mylan has come under increasing scrutiny by lawmakers on Capitol Hill, federal agencies and state attorneys general after the company raised the price for the EpiPen more than 500 percent since 2008. The device is an auto-injector used to reverse serious allergic reactions. Mylan said the settlement "did not provide for any finding of wrongdoing."